This article was written by blogger Denis Kazanskiy for “Ostrov” a few days before the shootings in Sloviansk. 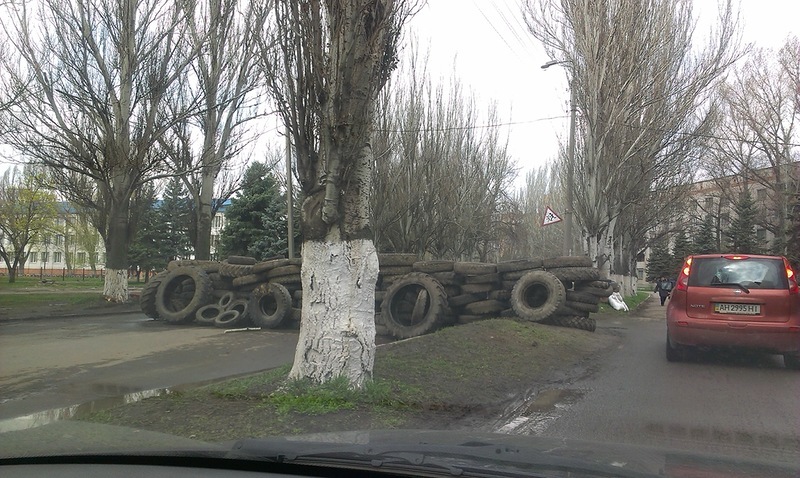 A boring provincial town of Sloviansk where nothing ever happens suddenly made it to every newscast around the world. The reason for this is not its shabby resorts or any scientific breakthroughs. Sloviansk made headlines due to its seizure by the terrorists and the ensuing mass disorders. The map with the burning red point can be seen on every TV screen in every corner of the globe. Foreign journalists have finally managed to pronounce “Sloviansk” which was a tall order just a few days before. The most experienced of them, those who covered warfare elsewhere, say it looks like Chechnya, that’s how things started there. 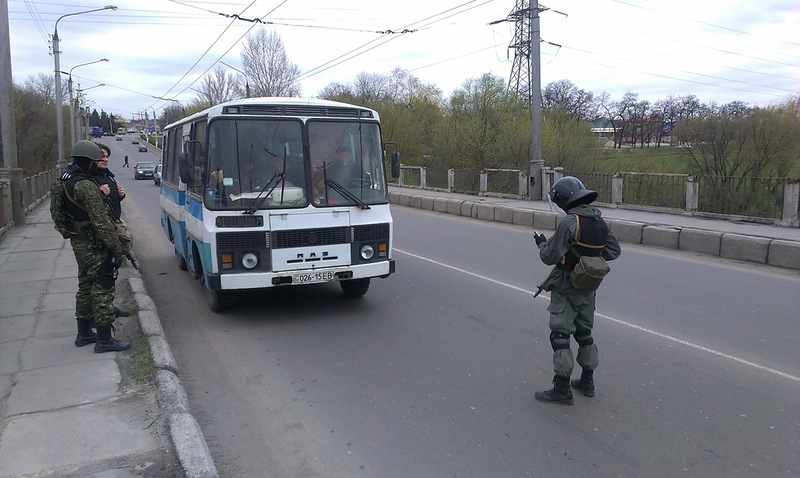 Sloviansk is not controlled by the Ukrainian authorities. 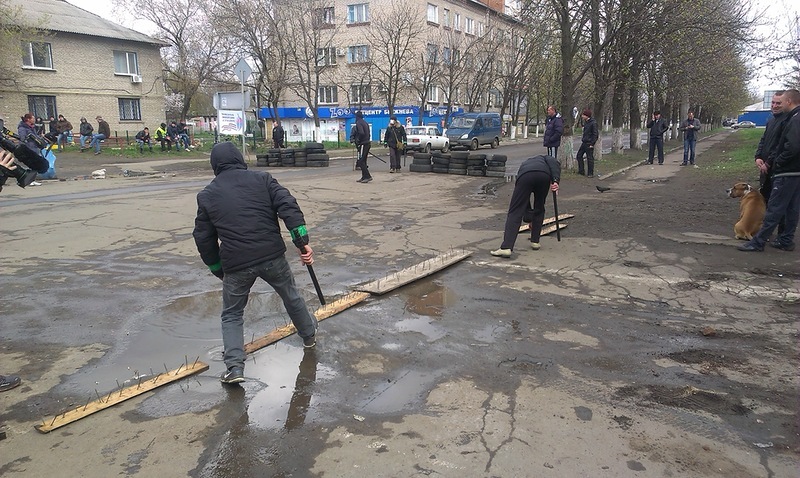 The city is in the hands of separatist groups and looks somewhat like Huliaypole [the capital of Nestor Makhno’s anarchists in 1920s] surrounded by the tire barricades. Rows of barricades block the roads leading into the city. The checkpoints are controlled by the now familiar guys in masks and helmets, some of them with guns, some with bats. Some of the guards wear reflective jackets of the traffic police. They don’t conceal their pleasure at stopping cars, ordering to open trunks and carrying out inspections. The former trade college students who only yesterday timidly slipped a 20 hryvnia bribe for an exam are intoxicated with a sense of self-importance bestowed by their new position of power. Separatists become very aggressive when they are called separatists. They believe it is a dirty word although there is nothing offensive about it. It literally means “supporters of partition.” Most of the participants of the anti-government actions declare openly they want to secede from Ukraine either to Donetsk People’s Republic or to Russia, yet they are extremely displeased to hear the unfamiliar word. 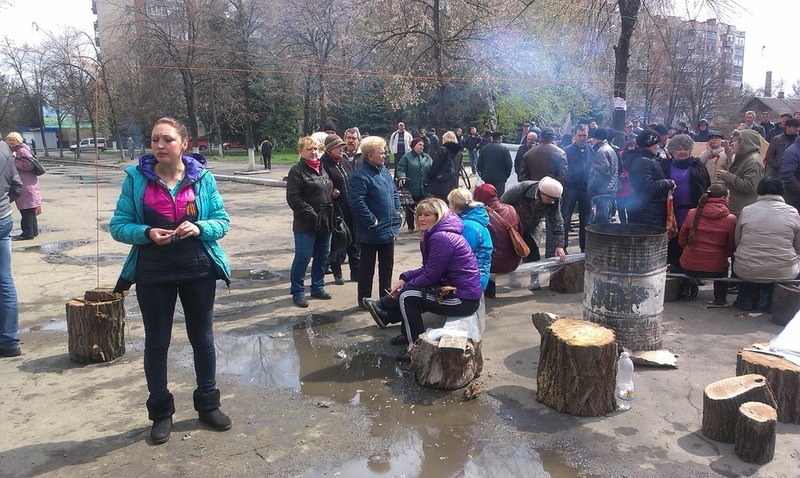 After the events in Sloviansk began, the number of people and cars in the streets has sharply declined. This unusual emptiness is striking for a city of 120,000 inhabitants that just a few weeks ago seemed like a bustling place. 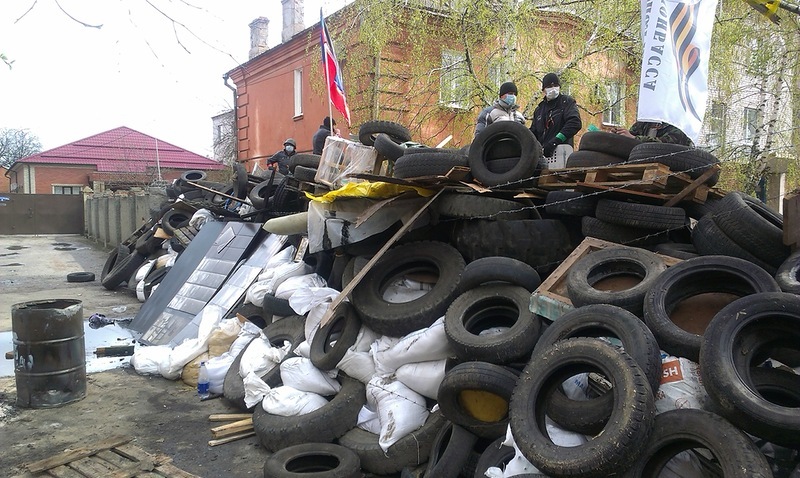 Some of the city streets are blocked by the barricades made of tires, wood and barbed wire. Trucks are parked to block the roads. 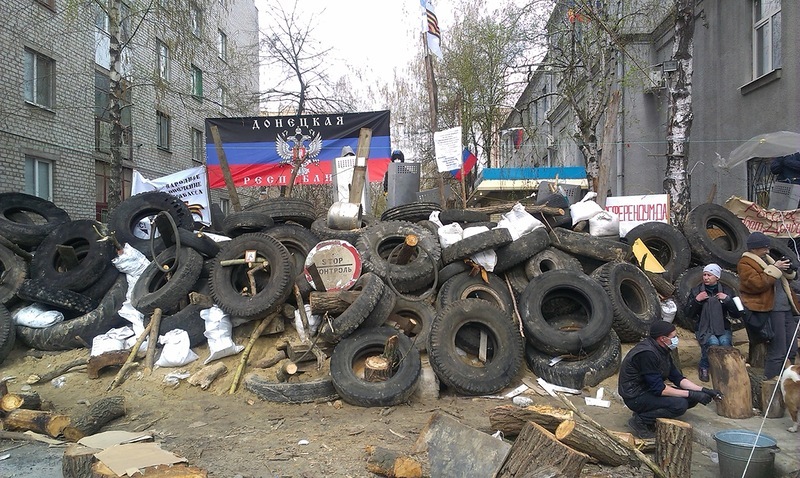 The barricades near the police office seized by the armed men have reached two meters in height. 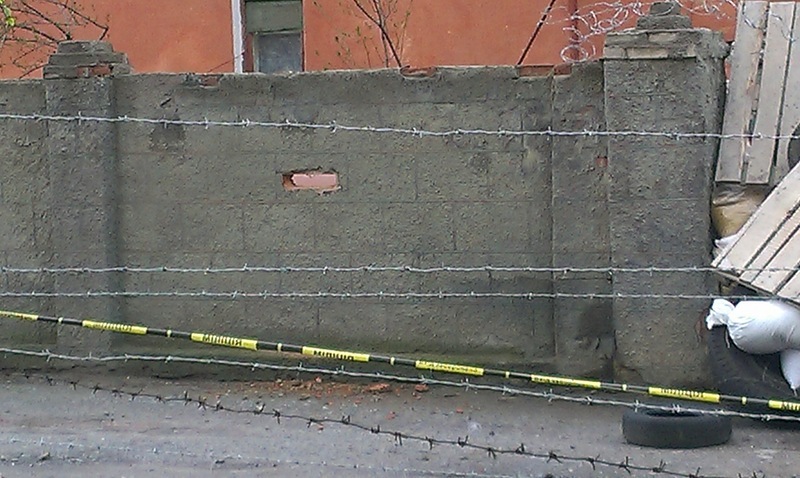 Gun slits are gouged in the stone fencing of the internal affairs department. The demands of separatists are hazy, though. Some of them claim they want federalization. Some insist there can be no life in a united Ukraine. It is difficult to tell how many people take part in “defending the city” from the Ukrainian armed forces and SBU [security service] troops, looks like there are about one thousand of them. Armed people are constantly cruising around the city by foot and by cars. They are carry rifles, guns, machine guns and Makarov guns. The biggest crowd rallies at the internal affairs department building. Women and pensioners keep vigil all day long ready to serve as a human shield in case of an attack. The “little green men” are also present. They were seen at the checkpoints near the city entrance on the first day. Afterwards, they moved to the seized city council, leaving locals to guard the checkpoints. The situation, long since methodically instigated by the Party of Regions, now seems to have spun out of their control. Sloviansk mayor Nelya Shtepa, who first tried to gain the sympathy of separatists and even openly voiced her support, now has few flattering things to say. According to her, the power in the city is usurped by uncontrolled foreign criminal elements and that marauding is rampant. 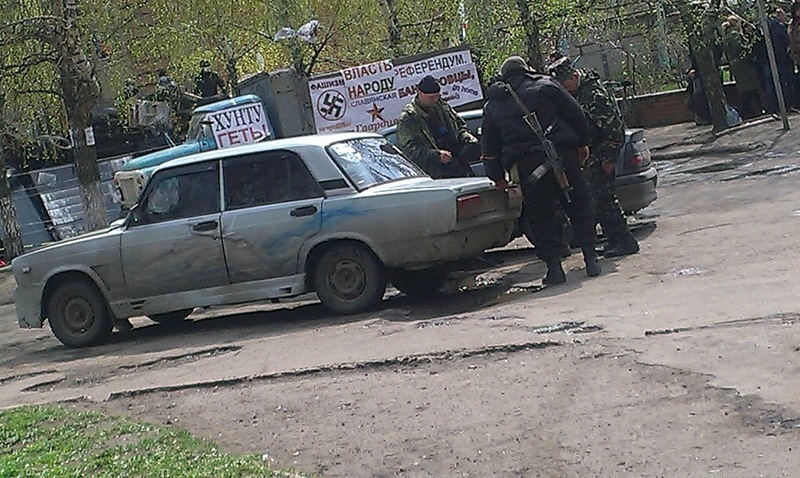 The separatists have in turn overthrown Shtepa and declared their own mayor for Sloviansk. They seem unlikely to engage in negotiations and are as critical of the Party of Regions as they are of the Kyiv authorities. The main problem lies in the refusal of the separatists controlling the city to negotiate. Their representatives say they do not believe any of the Ukrainian politicians and do not recognize Yatsenyuk’s government. However, they have no idea who, if not [Prime Minister] Yatsenyuk or [Acting President] Turchynov, could engage in talks with them or provide any guarantees. It looks like a dead-end. The other problem, or rather disaster, is the total disinformation of most protesters and citizens. 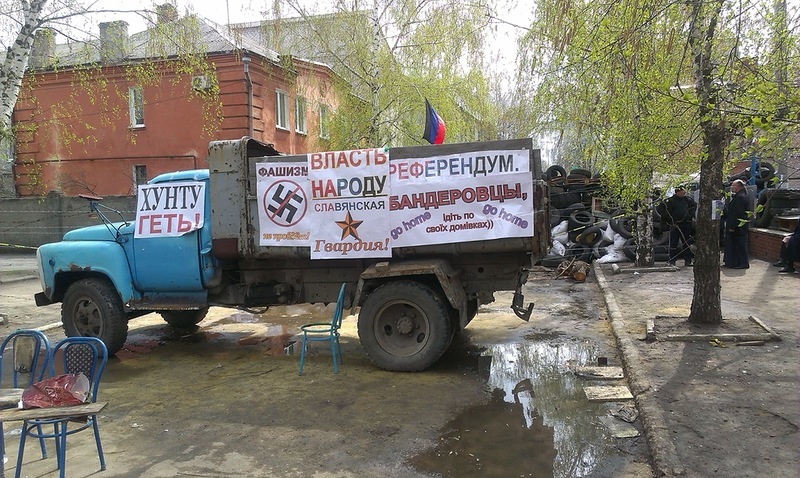 They admit that they were driven to such radical activities by the fear that the Right Sector fighters would come to the Donetsk region, ready to punish the locals for their pro-Russian attitudes and force them to speak Ukrainian. Meeting after meeting, pro-Russian speakers announce the most unthinkable scourges, which the Ukrainian government would allegedly subject them to, and work themselves into a hysteria. Among the horrors looming over Donbas, there are compulsory vaccination, biometric passports, dismissal of ethnic non-Ukrainians from public service and many other tall stories circulated in the internet. It is hard to imagine how anybody could believe such nonsense but it looks like people are ready to uncritically accept information from the most dubious sources. Such make-beliefs form the entire ideological basis of the Donetsk rebellion. There is no clear solution in sight. You can only prove a person wrong if that person harbors any doubt and is prepared to think critically. But how can you prove one has misjudged if this person does not want to entertain any evidence and immediately declares every alternate opinion a lie? And furthermore, if you persist, this person threatens you with a gun? Getting through to such a person is no trifle task. Sloviansk is gripped by a self-imposed siege and, if nothing changes, the citizens will soon feel the gravity of their current situation. Some banks and shops stopped working a few days ago, some goods are no longer delivered to the city probably because the suppliers are afraid of getting robbed. The locals most likely will not get their salaries and pensions on time. 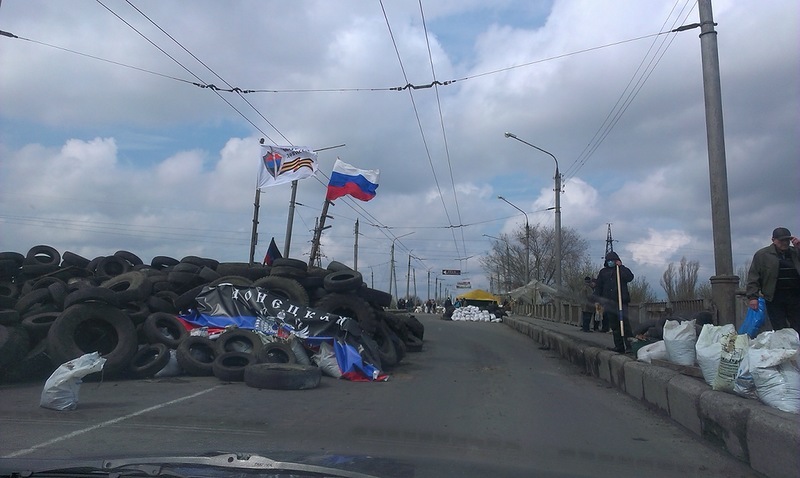 Donetsk oblast, traditionally so tranquil and drowsy, is now a footstep away from the civil war. One can only hope that the activists would not dare to make this final step.